Building Our House of Grey and White: Site cut has begun Finally!!! On a Saturday too. My husband had a meeting with our SS early thursday morning at the block to go over the build and any concerns we have (we have heaps) and the guy doing the earthworks was there as well and it was mentioned that the site scrape would be done before Monday so when I drove out today at lunchtime I was expecting something to be happening and I wasn't disappointed. Was a little embarassed to get too close to take pics so will head back out again to see what the final result looks like. 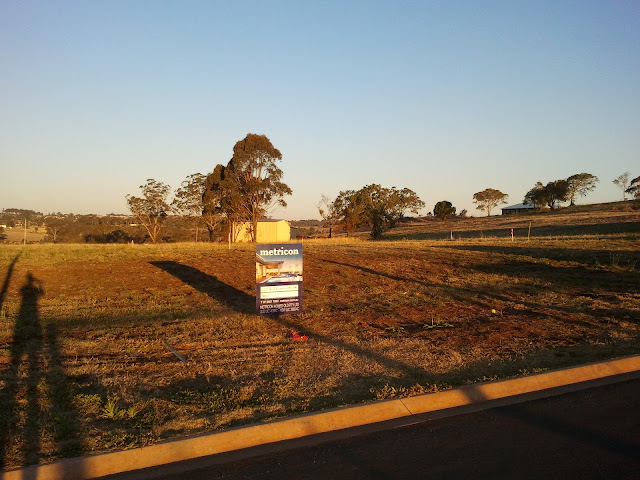 Here is the empty block just last week where we finally recieved our Metricon sign, thought we were never getting one. Natasha, I stumbled across your blog while I was doing a search of Milton Moon images for my new website. I'm so glad I did. I wish I had known about your before as I would have loved following along with your building journey. But I'm glad I'm here for the last few hurdles! Your house is looking absolutely beautiful. Your kitchen is to die for. I hope you'll let me put some pics of it on the blog when it's done. You clearly have fabulous style and taste. Hope the rest comes together without too much drama!